The festival runs over 4 days starting with the Trail Camp on the Thursday, this is where you can purchase trail running goodies, or if your French is good chat to the stall holders. There are 6 races in the festival starting with the 90KM Ultra who started out very early Friday morning. We were to trace part of the route the same day along the Grand Balcon Nord. Our guide suggested taking a more direct route down the mountain to get out of the way of the leaders. This route was not for the faint hearted but it did have the bonus of seeing the winner of the 90KM running the last bit through the forest, he had been running for over 11 hours and looked as fresh as if he had just gone for a short run! At 4pm the same day was the start of the KMV, the Vertical Kilometre. Each runner declares their predicted time to finish and are set off in time intervals accordingly. The fastest this year was a British runner in a time of 34:46, wow. Saturday sees the start of the 23KM race which finishes in Plan Praz, the first person home at a time of 2hrs 16. At 1pm it was the turn of the 10KM, a field of 1250 runners. There was a moderate climb of 300 metres, but following single tracks and it being very hot progress was quite slow. More about the 10KM in a moment……. 8pm Saturday night the Duo Etoilé runners set off. If you have not come across this race it is run in pairs. They run at night covering a total of 17KM from Chamonix town centre up towards the first cable car station then return via the 90KM route. It was quite exciting seeing them return and some even had enough strength to give a piggy back over the finish line. Chamonix was out in force to cheer them home. Now back to that 10KM race!! 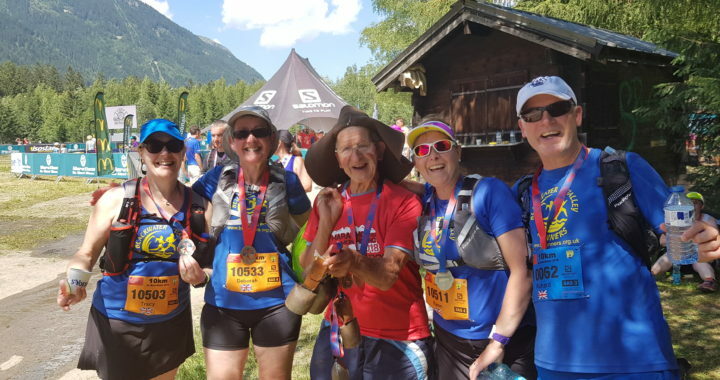 After an enjoyable 5 days trail running in the Chamonix Valley, we wanted to put the skills learned to the test by running the Mont Blanc 10KM. Richard joined us for the race along with a good friend JC. Richard and JC were in pen 3, Deb, Tracy and me were in pen 4. It wasn’t a great idea to be in pen 4 as we had to wait 20 minutes after the first wave in scorching heat, the race started at 1pm! But we were off, nice steady pace along side the river Arve then up and up through the forest gaining 300 metres then down passing the other side of the river retracing our steps back to the finish. It just so happened to be my birthday on the day and I was greeted with Happy Birthday crossing the line. It was the most amazing experience and would definitely do it again.